For the first time since joining the spacefaring community in 1970, China is poised to eclipse the number of U.S. space launches in a single year. 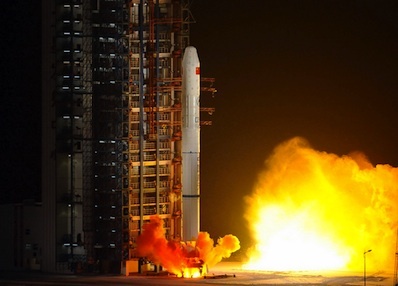 Launching clandestine military payloads, navigation and communications satellites, research platforms and pathfinders for its manned space program, Chinese Long March rockets have blasted off 17 times this year. One of the missions failed to reach orbit in August. The United States has launched 18 times in 2011. The U.S. launch record includes five Atlas 5 missions, the three final flights of the space shuttle, and three launches each of the Delta 2, Delta 4 and Minotaur rockets. The sole U.S. failure was the launch of a Taurus XL rocket with a NASA climate research satellite in March. No more U.S. space launches are planned this year, but at least one more mission is scheduled on China's manifest. A Long March 3B rocket is due to loft Nigeria's Nigcomsat 1R communications satellite Dec. 19, according to Nigerian space officials. The China Academy of Space Technology built the spacecraft. 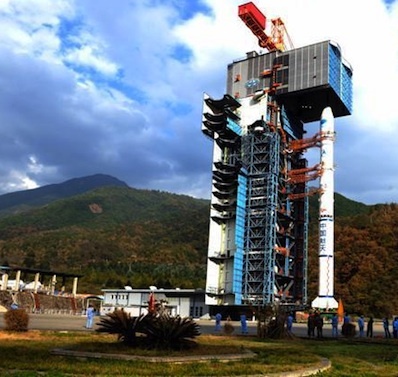 The Nigcomsat 1R launch will originate from the Xichang space center in southwestern China's Sichuan province. The Chinese military also operates the Taiyuan and Jiuquan launching centers elsewhere in the country. Various web sources speculate there may be another remote sensing satellite launched this year, but China does not officially acknowledge its domestic launch schedule far in advance. Nigeria released the target date for the launch of Nigcomsat 1R. One more successful satellite launch in December would tie the U.S. record for 2011. Both nations achieved 15 space launches in 2010. Two launchings this month would surpass the United States. If not this year, the U.S. could lose its long-held second-place ranking to Russia later this decade. Between 16 and 20 space launches are forecast from U.S. territory next year, none manned. China will launch one or two human space voyages, continue building its independent network of navigation satellites, and replenish fleets of spy satellites and research craft, including payloads for international customers. U.S. launches this year completed construction of the International Space Station and deployed scientific probes to Jupiter, the moon and Mars. Chinese rockets sent more commercial payloads into space than the United States, and they launched two spaceships for the country's historic first docking in orbit, laying the foundation for a manned flight next year. Russo-Ukrainian launchers have reached Earth orbit 27 times this year. That number includes a Soyuz flight from the European-owned spaceport in French Guiana, and a Zenit rocket mission from the commercial U.S.-based Sea Launch platform in the Pacific Ocean. China's Long March rocket family has flown 153 times since launching the country's first satellite in April 1970. Nine of the launches have been partial or complete failures, making for a 94 percent success rate. A handful of other Chinese launchers have also reached orbit with payloads. China was the fifth nation to achieve an independent space launch capability after the Soviet Union, the United States, France and Japan.